Current online gaming laws in Ukraine are bad for operators, but they have little effect on players. 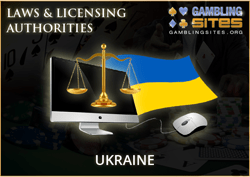 Like many countries, Ukraine has a prohibition on the operation of any gambling site. Individual players aren't targeted and have access to a wide range of foreign betting sites. The sites that we recommend for Ukrainians aren't licensed to do business in Ukraine, but they are safe places nonetheless. All of the sites mentioned on this site are licensed in other jurisdictions and are widely regarded as safe places to play. Legislation passed in 2009 effectively banned all forms of gambling in Ukraine other than the lottery. The bill resulted in the closure of all brick-and-mortar casinos, gambling parlors, and it also enacted a prohibition on online gambling. Operators found a loophole in the 2009 law that allowed them to move their servers outside Ukraine and continue to serve Ukrainian customers via the internet. The government passed an amendment in 2011 and ended that. Today anyone involved in the business of gambling, whether online or off, can be prosecuted. The internet gaming industry still thrives in Ukraine; it just doesn't benefit Ukrainian businesses. The legality of placing bets online as an individual is unclear, but it doesn't seem to matter. Ukrainians are able to visit hundreds of foreign gaming sites to place bets, play poker, and risk money in casino-style games. Most of the major names on the international stage accept customers from Ukraine. Ukraine looks a lot like the other countries we discuss here at GamblingSites.org. It has a strict set of gaming laws, but it's unable to stop the people from gambling. Fortunately, Ukraine hasn't gone so far as to enact an internet censorship program like its Russian neighbors. The Ukrainian-Russian conflict is ongoing at the time of this writing and we don't yet know what effect this will have on online gambling. Additionally, the Ukrainian President was ousted during the 2014 revolution and an interim government replaced the outgoing government. Things are in a state of flux right now and nobody knows what, if any, impact this will have on the industry. Prior to the Ukrainian revolution, the Ukrainian government announced that it was looking into possibly legalizing and regulating online gambling. It's anyone's guess as to where those plans stand now. Russia's takeover of Crimea has also changed things. In April of 2014, Russian President Vladimir Putin introduced a bill to establish a gambling zone in Crimea with the intention of turning it into a major gambling destination on par with Las Vegas and Macau. It's unlikely this new region will include any provisions for online gambling given Russia's firm opposition to e-gaming.